Aristotle claimed that Art Imitates Life; Oscar Wilde claimed that the converse was more likely to be true. Let us say that both positions are valid. Last night, Divaria Productions presented a fascinating exploration of how the extravagant lives of librettist Lorenzo da Ponte and singer Manuel Garcia influenced and were influenced by the opera Don Giovanni. We have always suspected that the rebellious Mozart saw himself in the unrepentant Don Giovanni who refuses to bow down to the father figure--the Commendatore. But we hadn't given much thought to da Ponte's identification with the libertine character of that anti-hero. Nor did we know anything about the connection with the Garcia family and the opera's first production in New York. 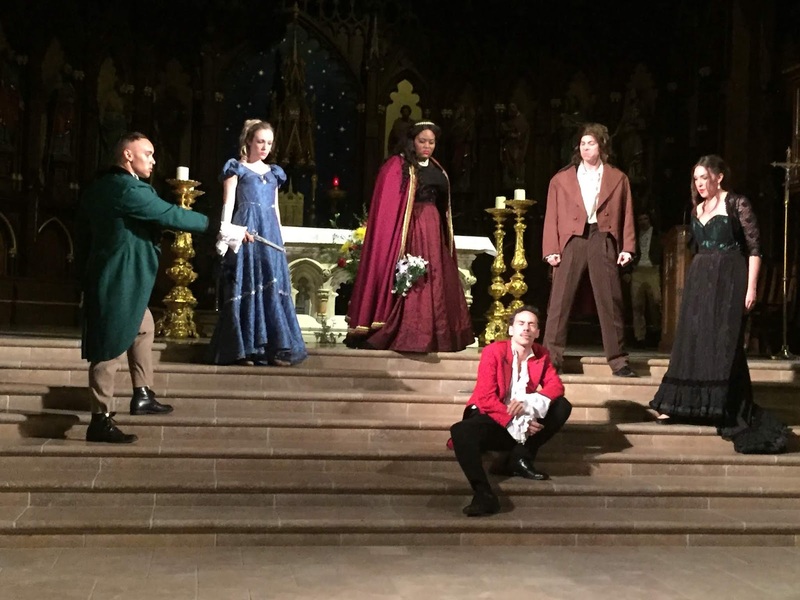 Thanks to the diligent scholarship and astute writing of Andrew Bell, the scripted production of Don Giovanni in New York left us with much to think about, as well as some memorable performances dancing around our brain. If the facts were stretched a bit for dramatic purposes, our rejoinder is "Se non è vero è ben trovato". Much of the dialogue was drawn from the memoirs of the Garcia family and those of Signor da Ponte. The performance took place in the Old St. Patrick's Cathedral in Soho, of which da Ponte was a parishioner. It is a fact that the Garcia family was brought to the United States by da Ponte who was responsible for introducing Italian opera to New York. The Garcias opened Don Giovanni at the Park Lane Theater on this exact date (May 23rd) in 1826! (We do believe a French opera by Grétry was performed in the Louisiana Territory in 1784). Mr. Bell tells the story of this production, using excerpts from the opera to illuminate the inner feelings of the characters. Garcia cheated on his wife, a singer also, with another member of the cast. Mr. Bell's script plays off the characters of the opera and there was drama aplenty. The astute lighting by Anthony Tornambene went a long way toward making clear which were real scenes between the characters and which were scenes from the opera and which were scenes showing memories of the characters. If this sounds confusing, well, it was a bit. It would have been helpful to have read the extensive program in advance to understand why scenes from the opera were drastically out of sequence. It would also have helped to have better acoustics. The cathedral is highly resonant which served the singers better than it did the actors portraying the characters of Da Ponte and the Garcias. We missed a lot of the dialogue but heard enough to get the gist of the story. The singers were well cast and we enjoyed the arias and duets, even out of sequence. We wondered whether this would be more meaningful to people who knew the opera or to those who did not. The vocal part of Don Giovanni was sung by the very physical baritone Ricardo Rivera (our favorite Escamillo) who was as compelling vocally as he was dramatically. His sidekick Leporello was superbly portrayed by bass Richard Bernstein who gave as fine a performance of "The Catalogue Aria" as we have ever heard. In this story, the nascent production at first lacked a tenor to play Don Ottavio, but they found one in Jordan Weatherston Pitts who performed "Dalla sua pace" with gorgeous tender tone and fine phrasing. Bass Tyler Putnam, well remembered from multiple performances at Santa Fe Opera, was effective as Masetto and chilling as the Commendatore in the final scene of the opera. The female parts were similarly well cast and sung. Soprano Ashley Galvani Bell made a superb Donna Anna and sang a melting "Non mi dir". Her duet with Mr. Pitts "Fuggi crudele, fuggi" was masterful. As Donna Elvira, the big beautiful sound of Helena Brown was perfect. We have reviewed her performances many times in the past five or six years and have sometimes called her a mezzo because there is so much texture in her tone. Her "Mi tradi quell'alma ingrata" was riveting and delivered within the context of Garcia's wife berating her husband for seducing the singer performing Donna Anna. The role of Zerlina was sung by mezzo-soprano Natalie Rose Havens whom we well remember as Lola in Martha Cardona Opera's Cavalleria Rusticana. Her "Vedrai carino" was here sung with a different emphasis--the singer is thinking of her real-life lover, not Masetto. The speaking parts were as follows: Michal Gizinski created the persona of da Ponte who narrated the evening. Anton Armendariz Diaz created the character of Manuel Garcia, the singer imported from Spain to introduce opera to New York City. The role of his browbeaten daughter Maria was performed by Paulina Cossio and her fiancé was performed by Jon Faughnan. Their marriage was accompanied by Jared Lamenzo, the Basilica organist. Mozart's score was given to the New Asian Chamber Society, a string quartet augmented by the piano of Music Director Nicolo Sbuelz. To say that the music was marvelous would be an understatement. Direction was by Mr. Diaz. No costumer was credited but the entire cast looked great and we felt transported back to the 1820's. The performance will be repeated in Sag Harbor at the Bay Street Theatre on September 22. And yes, it would be worth the trip! Not only for Mozart's music and the fine performances, but also for new insights into the manner in which we identify with literary characters and/or project our own characters onto them.